Item ID: 15442 INV ID: You are not signed in. Login Here. LOVELY BIG MARE. NO VICES. 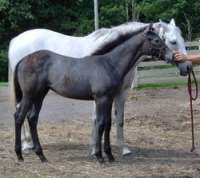 HAS ALREADY PRODUCED STAKE FILLY. HAS 2018 FILLY BY TIZWAY AND OPEN FOR 2019 SEASON. OWNER GOING OUT OF BUSINESS.